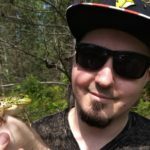 In this post, we are pleased to feature Matt Ellerbeck, a salamander advocate and conservationist, who created the Save the Salamanders project. 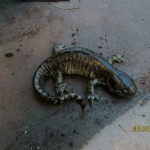 Matt Ellerbeck, aka The Salamander Man, is a man with a mission: he is striving to raise awareness of the threats that salamanders face, and to educate people on effective actions that they can take to help alleviate these threats. 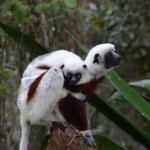 The actions include behavioral changes, land stewardship, and habitat management efforts. To bring his message of salamander conservation and protection to the public, Matt utilizes several platforms: media appearances, awareness campaigns, social networking, the distribution of informative fact sheets, and educational presentations/lectures. Matt also aims to help salamanders by diligently collecting observational records of these animals in the wild. These records are sent to various organizations to help gain a better understanding of salamander populations, ranges, and habitats. 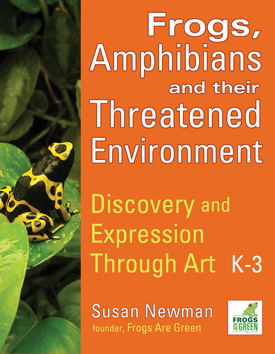 He hopes that through awareness and education, people will develop a sense of empathy and concern for salamanders, and in turn will have a desire to become active in their recovery. 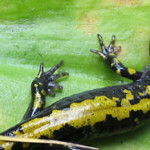 For those who do want to contribute to the conservation & protection of salamanders, his site contains much information on how to become active. Everything that I do, I do because I sincerely believe it will help contribute to the conservation & betterment of salamanders, which is my ultimate goal and ambition! Salamanders are the focal point of my life. There is not a day that goes by that I am not doing something salamander related, whether it’s presenting educational lectures on salamander conservation, writing articles, giving interviews, or collecting observations of salamanders in the wild. When I am not doing such activities I am planning and prepping for such efforts. A good portion of every day also goes towards the care of the many salamanders that I live with. These salamanders take turns accompanying me during my lectures and presentations to act as education animals and ambassadors for their kind. This entry was posted in Amphibian habitat loss, Amphibian research, Climate change and the Environment, Deforestation and amphibians, Eco Interviews, Salamanders and tagged awareness and education of salamanders, educational lectures on salamanders, Matt Ellerbeck, observations of salamanders in the wild, salamander conservation, Save the Salamanders, The Salamander Man. Bookmark the permalink.